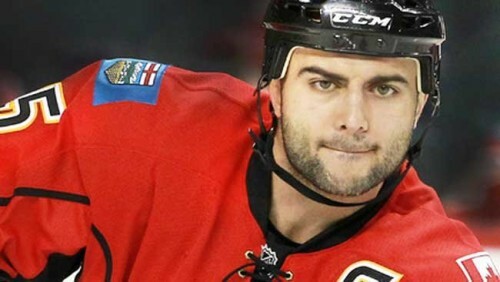 Should Mark Giordano's injury affect Calgary Flames' deadline decisions? Home/NHL West/Calgary Flames/Should Mark Giordano’s injury affect Calgary Flames’ deadline decisions? D-Day is looming – deadline day, that is – and pressure is building for many teams, including the Calgary Flames. Curtis Glencross’ name has already been dangled as trade bait, and with the Flames in the middle of a playoff battle the question has become: buyers or sellers? Even with a healthy team the answer wasn’t so easy to come by, but the injury (in all its uncertainty) to Mark Giordano has thrown a wrench into the plans. Does Brad Treliving use the existing interest in Glencross to his advantage, swapping him – and possibly other assets – for a third or fourth defenceman? Or does he look in house and use Glencross in another fashion? The route the Flames should take – but not necessarily the one they will take – is to stay the course and work with what they have. Even before the Giordano injury the feeling in-house should have been that the Flames are a young team and, although they’re having success now, will be even better in the next year or two. To trade one or more of these young players for a veteran who may not even get the team to the playoffs would be a short-sighted decision to say the least. It’s not as though the Flames aren’t well-equipped to fill the hole created by Giordano’s injury – they have options such as Dennis Wideman and Deryk Engelland who can slot in on the top pairing with TJ Brodie. Elsewhere, they can round out the top-six with either veteran journeyman Corey Potter (who hasn’t played a game in the NHL this season) or up-and-coming blueliner Tyler Wotherspoon from Adirondack. Up front, as mentioned, Glencross is the only player who has been actively shopped by Treliving (publicly, at least). Though he is fourth on the team in points, the indication is that Glencross won’t re-up with the team, making him an expendable piece. But as forwards go, Glencross should be the only one on the NHL roster who gets moved. The core group of forwards – among them Sean Monahan, Johnny Gaudreau, Josh Jooris and Markus Granlund – are still young and coming into their primes. Letting them take the reins on this playoff push could do wonders for their experience and, although it may not pay dividends this season, could help them in the future. Aside from helping their experience, trading one of these young forwards – unless they can get another in return (which would essentially make the trade redundant) – would do more damage to the rebuild than making the playoffs would. It’s not as though the external pressure to make the playoffs is suffocating, so Treliving shouldn’t act rash. The flip side to the stand-pat argument is the Flames will be drastically under-prepared to fight for a playoff spot, while the teams around them are tooling up for the playoffs. But just because other teams are doing it doesn’t mean Calgary should. The Los Angeles Kings, Minnesota Wild, Chicago Blackhawks and other teams are in that window of opportunity right now, so they are justified in giving up picks and prospects for the short-term. But Calgary isn’t in the same situation, and shouldn’t break under the pressure of making the post-season.